More customers are arriving at ecommerce websites via mobile devices each day. Consumers seem to be more connected to the internet today, from all over, and performing all kinds of activities including shopping. Forrester Research anticipates mobile commerce will exceed $31 billion by 2016. The needs of these consumers have to be met by online sellers, lest they risk these consumers seeking a more mobile-friendly experience. Mobile commerce platform provider ShopVisible looked at some aspects of mobile shopping; among the topics they discussed was alternative payments. ShopVisible reviewed what they saw in the traffic across their platform in 2012, finding more than 25 percent of traffic originating from a mobile device. 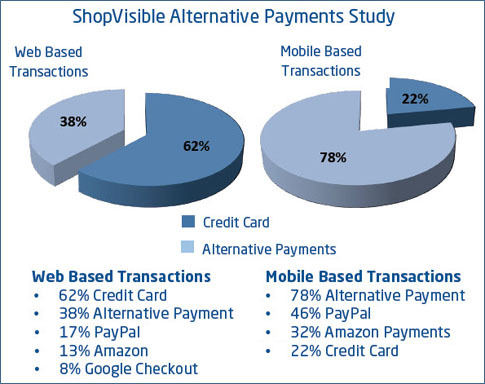 While credit cards dominated the preferred payment method from web-based transactions, ShopVisible saw 78 percent of mobile-based transactions using alternative payment methods. Comparison of the three most commonly used alternative payment types on the ShopVisible commerce platform revealed PayPal experiencing an upward year/year percentage growth in revenue, while Amazon and Google Checkout both experienced a decline. PayPal was the preferred alternative payment method for both web based and mobile based transactions. With the growth in mobile traffic across the ShopVisible platform, it calls to reason that PayPal's popularity as a mobile alternative payment method is a large driver for PayPal's year/year growth. For deeper clarity, we also looked at total transactions completed with each of the three alternative payment types. Transaction completed with PayPal grew 4.26%, while Amazon and Google Checkout both declined, by 7.8% and 44.8% respectively. Essentially, ecommerce pros seeing most of their transactions from the web converting with credit cards may see less of that from mobile visitors. If online sellers don't have alternative payment options in place, they might miss out on some of that forecasted mobile commerce growth. David A. Utter is a freelance writer based in Lexington, KY. He has covered technology topics from search to security to online business and has been quoted in places like ZDNet and BusinessWeek. He considers his appearance on NPR's "All Things Considered" with long-time host Robert Siegel a delightful highlight. Send your tips to media@davidautter.com and find him on Twitter @davidautter and on LinkedIn.